Never forget another meeting with this 1-month calendar with a magnetic dry-erase surface. A lined dry-erase section for notes and a trackable, cork strip are also included. Easily write down appointments or hang memos using either magnets or push pins. This 17" x 23" calendar board tracks 1 month (5 weeks) and is ideal for personal home or office use. Board hangs horizontally with the enclosed self-stick tape. Frame is black color. 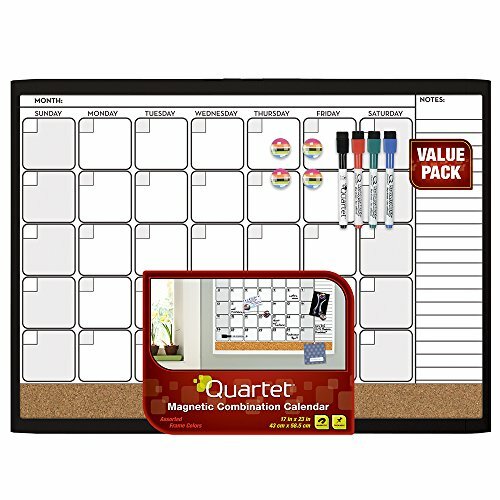 Value pack includes 4 Quartet ReWritables magnetic dry erase markers and 4 Quartet magnets.